I attended the October 26th meeting of the Citizen’s Coinage Advisory Committee in the Mint’s headquarters in Washington, D.C., and witnessed the members’ discussions of the reverse designs for the 2012 America the Beautiful Quarters. It was attended by seven of the 11 usual members: Dr. Mitchell Sanders and Arthur Houghton were not present for the entire meeting, and Dr. Doreen Bolger and Michael Ross, while present for other committee business, departed prior to the review of the quarter reverse designs. 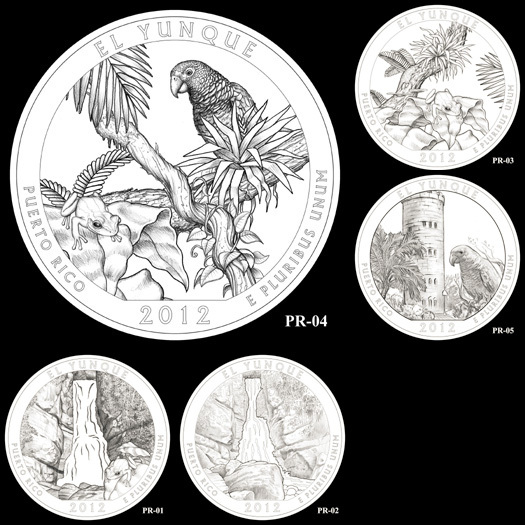 The first set of designs represented the El Yunque National Forest in Puerto Rico. There were five designs up for review for this quarter. Many members, including Donald Scarinci and Rev. Dr. Richard Meier, believed that the coqui frog on design PR-01 would resemble ‘a bug’ on the 1-inch quarter. Heidi Wastweet was interested in seeing the tower in design PR-05, but was concerned that it was chopped off at the top. In the end, design PR-04, with its depiction of both the coqui frog and the Puerto Rican parrot, received the committee’s recommendation with 12 out of 21 votes. Designs PR-01, PR-02, PR-03, and PR-05 received 11, 1, 4, and 5 votes, respectively. Note: During the committee’s July meeting, Ms. Wastweet made a motion that the design scoring system be changed to stipulate that a design would receive the committee’s recommendation only if it received in excess of 50 percent of the possible votes. If no design met that threshold, then no recommendation would be made. The motion passed the committee unanimously. The previous system had allowed for the design with the greatest number of votes to receive the committee’s recommendation. 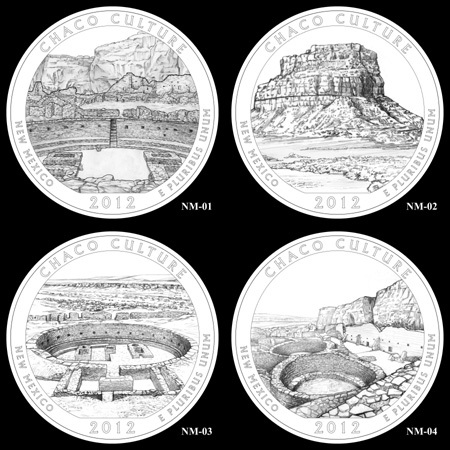 Next were the designs for Chaco Culture National Historic Park in New Mexico. Four designs were presented, but none garnered sufficient votes to receive a recommendation (the design receiving the highest vote count was design NM-04, with 7 votes). During the commentary on the designs, Chairman Gary Marks asked Kaarina Budow of the US Mint if the artists that created these designs had went to the park; she replied that they had not. Static images had been provided to the Mint by the National Park Service. Chairman Marks went on to say that the artists “did very good work with what they were given.” Ms. Wastweet remarked that this was a “difficult subject” to depict on a coin, a sentiment echoed by Mr Scarinci. Maine’s Acadia National Park was third, with five designs. Design ME-04, with a look that Rev. Dr. Meier described as “Maine-ness”, received a majority of the committee’s votes at 14, with design MS-03 running a close second with 11 votes. The other designs received the following votes design ME-01: 1, design ME-02, with a crashing ocean wave that Roger Burdette described as “a bush”, and Ms Wastweet called “confusing”, 1, design MS-05, with many member comments regarding the size of the people being portrayed, 0 votes. The Hawaii Volcanoes National Park was fourth, also with five designs. 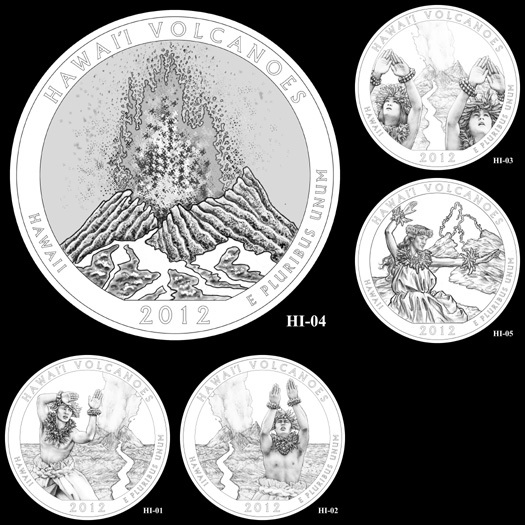 There was near unanimous agreement that designs HI-01, HI-02, HI-03, and HI-05, with their depictions of native dancers, were not well-suited for a quarter intended to commemorate the volcanoes. Mr. Scarinci put it simply: “The people have to go.” Design HI-04, with its singular imagery of an erupting volcano, was universally applauded, especially if the intentions of the Mint sculptors to enhance the lava are successful. The votes were as follows: design HI-01: 1 vote, design HI-02: 1 vote, design HI-03: 1 vote, design HI-04: 15 votes, design HI-05: 1 vote. The final set of designs were for the Denali National Park in Alaska, dominated by images of Mount McKinley and of Dall sheep, native to the area. The votes were clear: 16 of the 21 possible votes were given to design AK-02, while no other design received more than 6. With that clear majority, design AK-02 was recommended. After the vote, there was a motion to give consideration to enlarging the image of the sheep on recommended design, which passed five to two. Note: the universally-rejected design AK-04 was discovered by this reporter to be drawn from the photograph that appears on the National Park Service’s web page for the park.